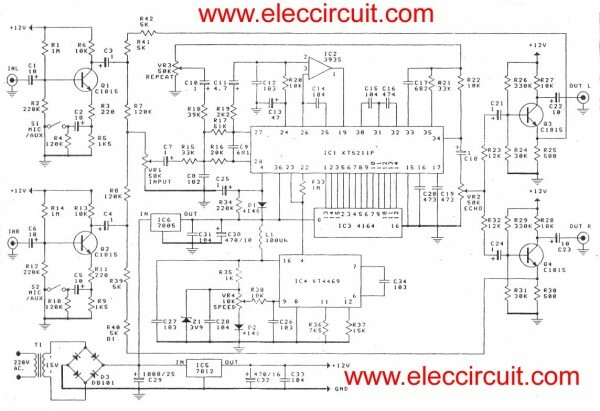 This digital echo stereo mixer project is circuits pioneering in the use of the old echo circuit before using the IC-BBD to the digital system. 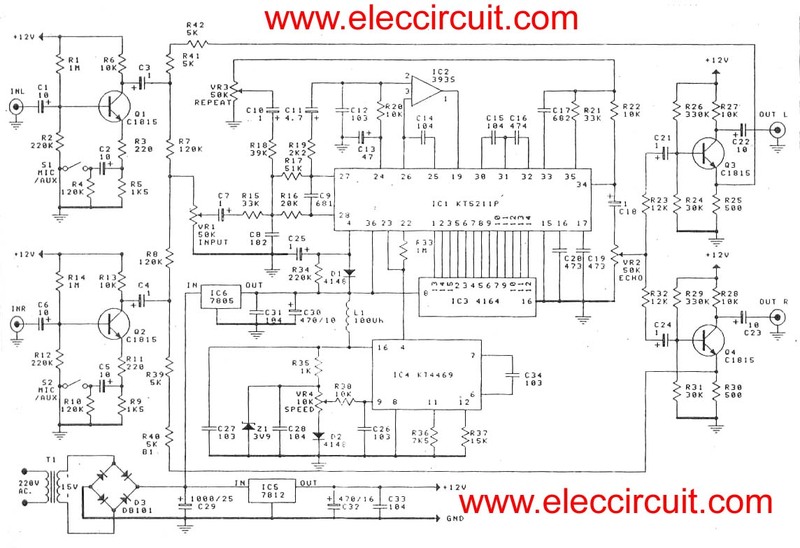 By using a digital echo circuit IC designed especially for the heart to work. This circuit is designed as a stereo system, to make it easy, and easy to-use applications, with your amplifier, followed circuit below. 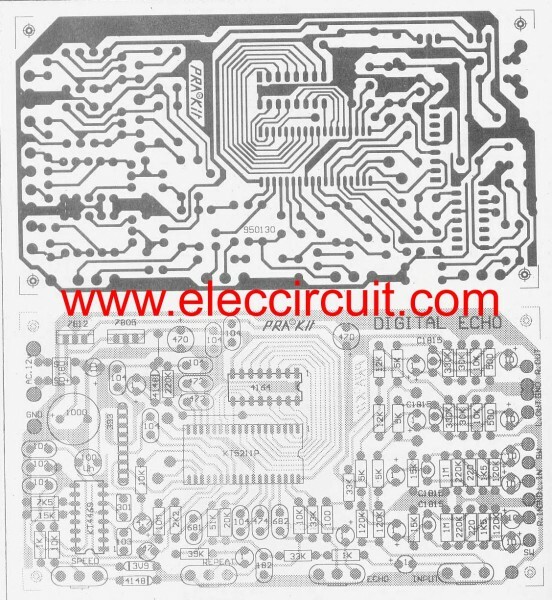 Be seen from the circuit, is quite simple consists of the main equipment are 4 transistor and 5 ICs only. The left channel input signal is entered pass through capacitor C1 to base pin of transistor Q1(2SC1815). Which is an input amplifier has a sufficient strength that enter to other next circuit section. The switch S1 is defined gain ratio of circuit suitable for input. When switch turn on , will be have high gain, For a record player or a micro phone or an input signal with low signal strength. Then we turn off switch S1 will be has low gain for the input signal with a high signal, such as a tuner or tape player or CD player etc. – The first way will be enter directly through the R41 to emitter of transistor of Q3 To include with signs through the delay signal circuit, until there is signs at collector pin through C22 to output L channel. – The output signal of Q1 another way will be entered through to R7 signal delay circuits consisting of IC1, IC3, IC4. VR1 use to adjusts the input signal that is input to delay circuit has high strength. VR4 used to fine frequency of clock signal. If you fine frequency to lower, the voice repeated will distance a range but high frequency Audio is faster iterative, stacked, like an echo signal. The output from IC1 at pin 34 will be through to C18 and VR5 to base pin of transistor Q3 for mixed with the direct signal has output is digital echo as you need. The some output from IC1 will be pass to R22 and VR1 feed back to input of IC1 makes has The sound duplicate If we fine VR1 to have a lot of feedback signal will have many repetitive sound. Be very much careful not to adjust, so that the oscillation. The work of right channel circuits same as the left channel, as described above. Creation and customize this circuits. Much easier because you do not need to tune circuits. Just included according to the circuit all devices on the PCB as shown only. The following applications can be connected as follows. 1. Connect the output of digital echo to input of stereo. 2. Connect input of digital echo to input signal( REC). For a player to MIC, and the output of this project. To the input of the amplifier to the tuner or AUX. Directly. Please tell me, how much big speaker I can connect to it. Like 12 inches? Or what. Please kindly reply me as soon as possible on my email. Thank you for your kind info and this diagram. I’ll be looking forward.